The 2015 World Series was the 111th edition of Major League Baseball’s championship series, a best-of-seven playoff between the National League (NL) champions New York Mets and the American League (AL) champions Kansas City Royals. The series was played between October 27 and November 1, with the Royals winning the series 4 games to 1. It was the first time since the 2010 World Series that the World Series extended into November. The Royals became the first team since the Oakland Athletics in the 1989 World Series to win the World Series after losing in the previous year. The Royals had home field advantage for the first two games of the series because of the AL’s 6–3 victory in the 2015 All-Star Game. It was the 13th World Series in which home field advantage was awarded to the league that won the All-Star Game. The series was played in a 2–3–2 format: the Royals hosted Games 1 and 2, and the Mets hosted Games 3, 4, and 5 (there was no Game 6 or 7, which the Royals would have hosted). 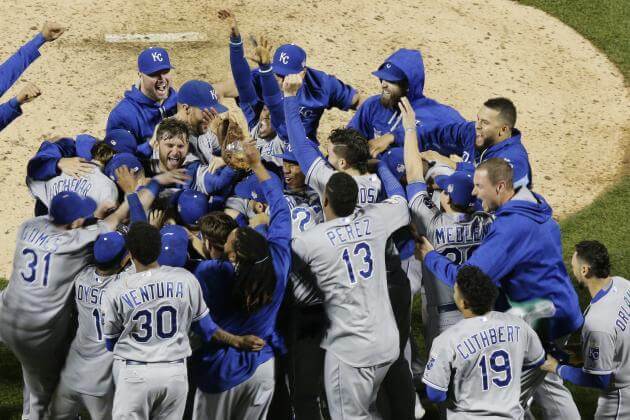 The Royals won Game 1 in extra innings, tying for the longest game in World Series history. The Royals also won Game 2 with a complete game by Johnny Cueto, who allowed only one unearned run and two hits. With the series shifting to New York, the Mets won Game 3 with home runs by David Wright and Curtis Granderson. The Royals came from behind to win Game 4 after an error by Daniel Murphy led to a blown save by Jeurys Familia. Game 5 also went into extra innings, where bench player Christian Colón drove in the go-ahead run for the Royals, who clinched the series. Salvador Pérez was named the World Series Most Valuable Player.